We are a new publishing house with the concept to make picture books with particularly detailed illustrations, which inspires the imagination of the children and satisfies their curiosity. There are books to leaf through and discover again and again new details to get lost in the pictures. Our texts encourage you to try out new things and fulfill your own dreams. These are often small people or animals that create great things and, despite initial difficulties, succeed. We have read a lot and exhibited books in kindergartens and hoards. In the process, we watched how children like to look at the pictures and discover things again and again. 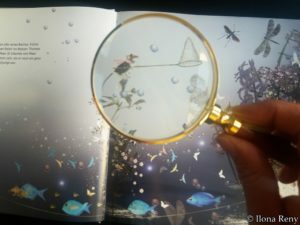 It is also very nice to look at the pictures with a magnifying glass. Katja Verlag is a small publishing company by Ilona Reny based in Frankfurt, which specializes in post cards and picture books. Ilona Reny illustrates and writes such books as she herself dreamed of since childhood. Her picture books are beautiful and unusually rich in detail. So children have fun while looking at the book and discover something new every time in the pictures. Her postcards have the same surrealist look. Each of them shows a world of fantasy that has its own rules of gravity and logic.